Television is the stunted younger sibling of film, but the past decade has seen it finally endure a growth spurt. Among legions of critically acclaimed original properties, recent years have seen a number of television shows based on films flower on the small screen, with Fargo, The Silence of the Lambs, and The Evil Dead receiving the small screen treatment in just the last handful of years alone. 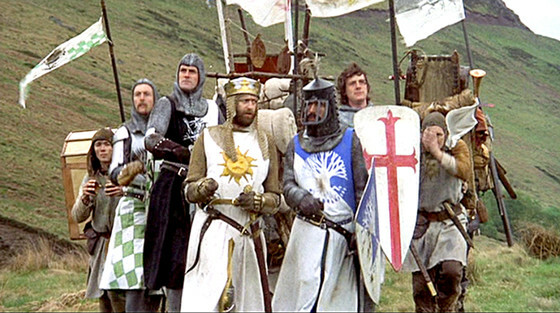 With this, it is sometimes easy to forget the long and often tumultuous history of cinematic adaptations of television shows, a much older tradition that dates back to the wild years of television history. A spotty track record of cinematic dregs (mostly Saturday Night Live properties) belies the diamonds in the rough, the cinematic television adaptations that not only pay homage to the spirit of their small screen ancestors but which advance those television shows into a distinctly cinematic realm. With this, here are 15 of the brightest films that owe their origins in the proving grounds of the small screen in one way or another. Note: For this list, a limit of one film per show was instilled, meaning that some tough choices excised a number of worthy candidates that are typically mentioned in passing within the specific entries below. The helicopter accident that resulted in the death of Renee Shin-Yi, Myca Dinh Lee, and Vic Morrow looms large over the disgruntled cultural memory of Twilight Zone: The Movie, a somewhat populist but intermittently incisive family horror film pitched around the heat level of Poltergeist and filtered through the ’80s early fetish for the late ’50s and early ’60s, the heyday of Rod Serling’s twisted, canted moral parable generator that forever transformed the face of television. The reputation of the film based on Serling’s eminently zeitgeist-defining televised cemetery The Twilight Zone has unfairly suffered, but the film doesn’t always make it easy on itself. The arid opening sequence with Dan Akroyd and Albert Brooks isn’t worth the punch-line, and John Landis follows with a thoroughly inconsequential first segment that unfortunately recaptures some of the show’s latent moral bludgeoning and little of its wit or ingenuity. Landis was on top of the world in 1983, and the fallout from the accident on set during his segment didn’t hurt his reputation. But the ensuing melancholy hangs over the segment like clinical depression, resulting in a tepid affair with a distinct aura of no one involved wanting to be on set. Steven Spielberg, even more famous than Landis in 1983, also falters with a segment that conflates the show’s worst saccharine habits and the director’s schmaltziest ones. The best episodes of the original show benefited from a zealous incandescence and a kooky, go-for-broke stylistic slantedness relative to regular society, and only in its final half does this film recapture that momentum. 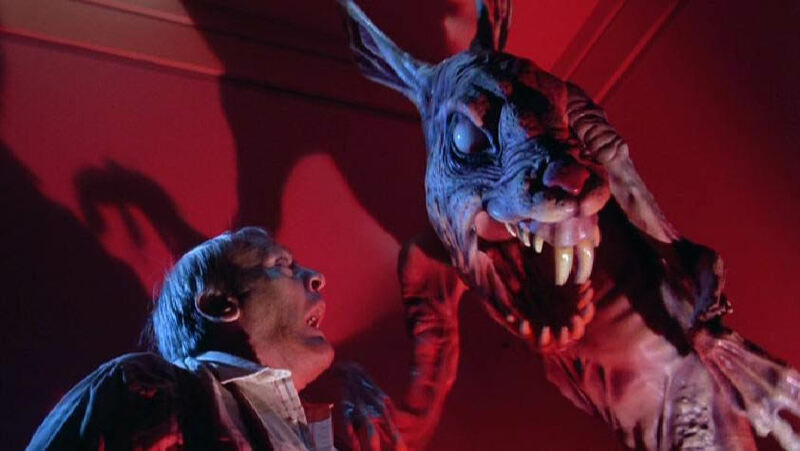 Particularly with the introduction of Joe Dante, who would helm the similarly sodium-encrusted comic horror Gremlins on the back of his short film here. He imbues the classic “It’s a Good Life” segment with a surfeit of Looney Tunes fire-and-brimstone and warped, tremulously menacing Americana – as well as some deliriously temperamental puppetry, Dadsist architecture, and garishly day-glo cinematography that perfectly pushes the black-and-white spirit of the original show into the glorious modern era while also visually poking fun of the sitcom-sets on which the show was made. The real highlight of the film, however, is the conclusion, an update of the show’s most famous episode “Nightmare at 20,000 Feet”, here turned into a frantic, nervous maelstrom of demented terror and shards of off-kilter energy by Mad Max’s George Miller in his first American directorial effort. The sequence is short, but Miller’s cocksure stylistic bravado wraps around the tale like a crawling king snake. This sequence alone is one of the finest American horror films of the 1980s, ensuring that Twilight Zone: The Movie would find then-blockbuster filmmakers at their driest (Landis, Spielberg) and two then-newcomers (Dante, Miller) galvanizing their path to the A-list. The Fugitive is a difficult film to write about. Directed by Andrew Davis, written by Jeb Stuart and David Twohy, and edited with a crisp immediacy by a murderer’s row of talents, it is an entirely functional, even mechanical machine of a film. But it functions so well that the relative lack of personality to the production is easy to overlook; The Fugitive is corporate cinema, but it is the Hollywood machine working to all of its better impulses, and falling prey to few of its common failings. 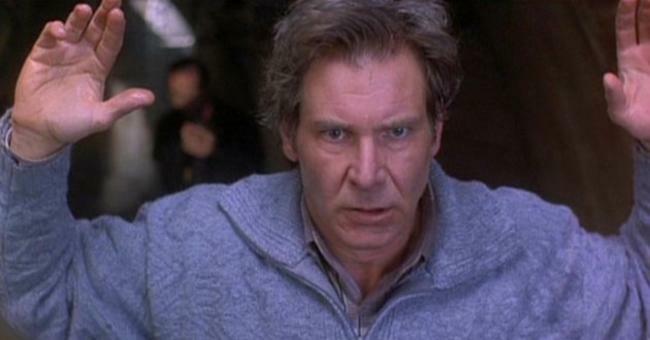 For one, The Fugitive is remarkably humble for a would-be blockbuster. There are few tangents or side-treks; everything is edited to within an inch of its life to fray the nerves and raise the pulse, and Davis displays a fluidity to his punchy directorial flourishes that evoke a choking sense of physical space in the film’s many evade-and-capture sequences. The camera always moves, emphasizing the thrill of the chase and the malleable physical distance, and thus the power relationships, between the prey (Dr. Richard Kimball, played by Harrison Ford, who has been accused of murdering his wife) and the predator (US Marshall Samuel Gerard, played with a cantankerous taciturn quality by Tommy Lee Jones in the film’s most human role of a man torn between duty and personal belief). It’s film school 101 stuff, but you’d be amazed at how many films get the fundamentals of thriller filmmaking wrong; that The Fugitive has such a sturdy base of crafty metal girders to stand on is essential to its success. Brian De Palma shoveled on narrative and conceptual gimmickry a mile wide as a ruse to distract from his questionable filmmaking. John Woo dumped a handful of high wires, a dozen pinches of general lunacy, a truckload of showboating histrionics, and more than a smidgen of masturbatory, madcap crane camerawork. JJ Abrams brought a thick scalpel and scraped away any and all sense of personality (not a bad thing, considering the particulars of the personality of MI II). 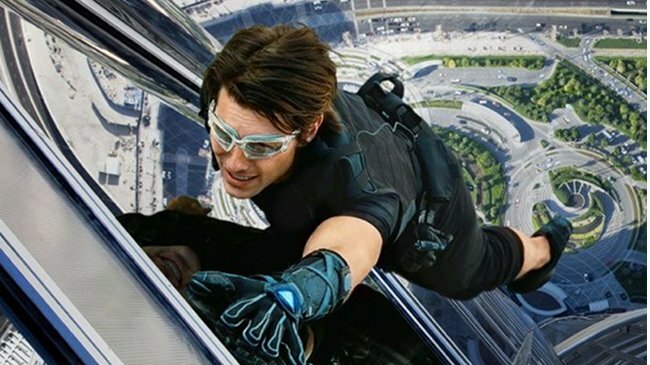 With Brad Bird, full-time dreamer, half-time Objectivist, and animation wizard behind The Iron Giant and Ratatouille, the beleaguered Mission Impossible franchise finally hit its stride. Unsurprising at that – who better but a filmmaker historically freed from the boundaries of realism and human flesh to inject a dose of vertiginous affluence and edge-of-the-seat panic to the franchise? Fittingly, Ghost Protocol is the most animated of the Mission Impossible productions, and although it lacks the almost Kubrickian genius of the deceitful Opera-house showdown of direct follow-up Mission Impossible: Rogue Nation, the sheer joie de vivre on display in the Moscow and Dubai sequences of Ghost Protocol are almost as impressive. Bonus points for Ghost Protocol for finally resurrecting the spirit of the original television show by humbling Tom Cruise a little and turning the series into a direct riposte to the Bond films it always aped. Lacking the grit of the Bourne films, the bombast of the MI films always faltered against Bond, but Ghost Protocol restore the teamwork at the heart of the show for a new center lacking in either other series. 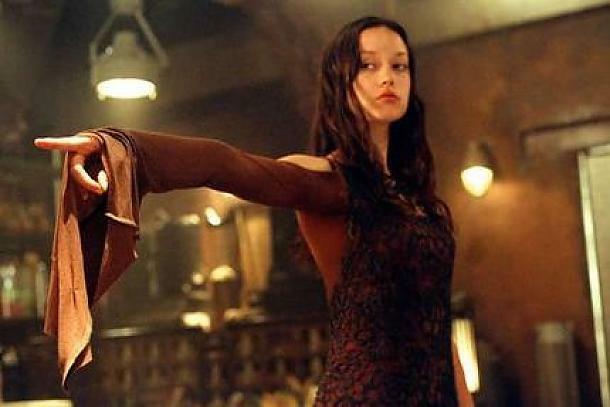 Perhaps the most heartwarming entry on this list, Serenity saw Joss Whedon’s fanciful, tactile Space Western Firefly – cut down by Fox in the prime of its life (as Fox is wont to do) – brought boldly forth on the winds of cinematic life with all of the strengths of its televised companion, and none of its weaknesses. Like a number of films on this list, Serenity is ‘nuthin fancy entertainment, but again, sometimes you do the fundamentals and that’s all you need. Whedon’s dialogue – his raison d’etre – is as fresh, acid-tongued, and tangly as ever, and he uses his capable cast headed by the ever-smarmy Nathan Fillion to dish out the scabrous dialogue like a short order cook matched to a fine dining expert. But it’s the cinematic flurry of Serenity that really surprises, showing Whedon in his first (and best) directorial outing using the full complement of cinematic tricks at his disposal to ensure Serenity is a distinctly visual, and thus filmic, beast. Right from the opening shot where he breathlessly tracks through the spaceship that bears the film’s title, Serenity flaunts Whedon’s giddy “I’m directing a movie!” excitement. Watching him glide from room to room and invoke the character relationships as they exist within the cramped, cluttered, utterly lived-in geometry of the ramshackle contraption they call home, there’s a sense that he is reconnecting with old friends. His directing throughout displays a shockingly breathless understanding of visual synchrony and symmetry, as if he had been dogged by claims that he was nothing more than a writer of pithy dialogue and wanted to make damn sure audiences knew otherwise. Not that he doesn’t write some wonderfully character-centric dialogue throughout the film, dialogue that not only writes itself out of a paper bag but investigates the tenuous relationships between the crew in the process. Add in a script with a surprising sense of finality and consequence and a sublime villain played with cunning sangfroid and supercilious menace by Chiwetel Ejiofor and you really can’t go wrong. No mere cash-in, Serenity is a fiercely mobilized send-off for a franchise that boldly and brashly succeeds at pushing the limits of the territory of that franchise into new mediums. Like all the great television adaptations, it is grounded in the show’s history but could never exist as just another episode on a small screen; Serenity is pure cinema always in the business of justifying its cinematic form. In the great “well, there are at least two good SNL films amid the torrential pile of raw sewage and tattered excrement the show usually produced when it went to the movies” debate of the past fifteen years, The Blues Brothers just had to be denied. That 1980 motion picture has moments of sheer dry-bones bliss where the laconic nature of the protagonists and the scruffy, aimless production qualities contrast beautifully with the grandiose energy of the set pieces, but the film is a touch too effortful for its own good. Saturday Night Live was the original slacker television show for burnouts and outsiders. There’s a sense with the Blues Brothers that it was trying to hard to be good, expending too much energy and tiring itself out in the process. 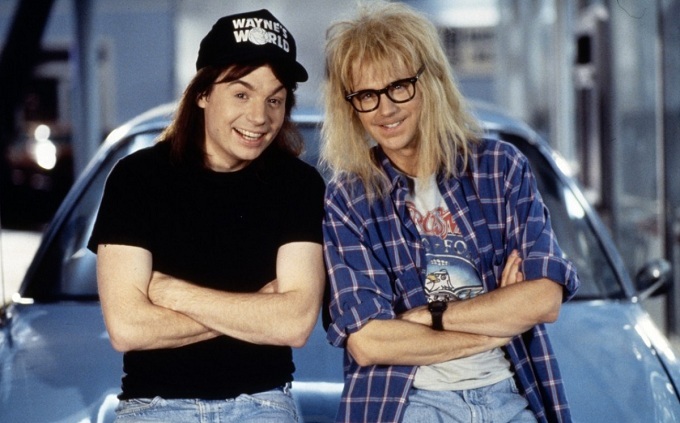 With Wayne’s World, we have a cinematic film about slackers that is itself a slacker film. A small pleasure, but a notable one. Thus, it is the SNL adaptation that most fluently captures the fits and starts of the ramshackle show in the first place. It feels the least driven, the least in search of a laugh at every turn, and its refreshingly lackadaisical restless-restfulness is a sight for sore eyes in an age of films that pummel audiences with momentary entertainment at every possible moment. Nothing about Wayne’s World feels maxi-packed for entertainment, and that oddly humble gesture of uncaring confidence – that it doesn’t need to entertain us because it is comfortable being its own wandering self – makes it feel like an old friend just dropped in, sat down for a beer, and slipped right into the conversation without missing a beat. Add in the disconcertingly innocent absurdist wit and the symbolically endearing, unforced performances from Mike Myers and resident immortal Dana Carvey and surprisingly sensitive direction from real-life chronicler of burnouts and slackers Penelope Spheeris and you have a film that, to quote a pair that Wayne and Garth might get along with just fine, is totally excellent.